College football fans were stunned this week to hear that South Carolina defensive end Jadeveon Clowney recently ran a 4.46 40-yard dash. He is 6-6 and 274 lbs. and I repeat: he ran a 4.46 40-yard dash. At SEC Media Days his head coach, Steve Spurrier, praised his ability to lay low and stay out of the limelight. Moments later Clowney took a page out of the Ol’ Ball Coach’s playbook and fired some verbal shots. Clowney mentioned in an interview that he knew several quarterbacks were scared of him. When asked which ones he responded, “Aaron Murray is one of them,” before listing Clemson signal-caller Tajh Boyd and Arkansas QB Tyler Wilson. Aside from the fact that any QB in the country should be looking at Jadeveon Clowney pre-snap (it’s the right thing to do), I think Clowney missed a very key point. Aaron Murray needs to be afraid of Jadeveon Clowney. As a Georgia fan I’m OK with that. Clowney is a skilled player who is certainly capable of hurting Aaron Murray who is nearly 70 pounds smaller. I don’t want Aaron Murray hurt. If Murray got hurt who would play QB for the Bulldogs in the SEC Championship Game? If Murray had been reckless with his body against South Carolina in 2011 and 2012, Georgia might not have even earned a trip back to Atlanta. I guess Clowney wouldn’t know anything about that, though. He’s never played for an SEC Championship. He’s never needed to be healthy on the first Saturday of December. Clowney seems to have a somewhat selective memory. Last year he – and the South Carolina defense as a whole – wreaked havoc on a Georgia offense that was crippled by Special Teams errors, field position and mental mistakes. Murray’s statline for that game epitomizes the success of the South Carolina defense that day: 11 for 31 passing for 109 yards, 0 TDs and 1 INT. Clowney seems to have forgotten Murray’s 19 of 29 performance in 2011 that yielded 4 TD passes. He also seems to have forgotten that Georgia is the two-time defending SEC East Champion. 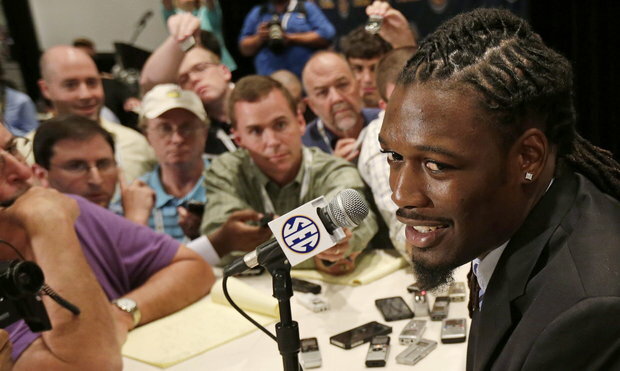 Clowney labeled Florida as South Carolina’s biggest opposition this season. The real threat to South Carolina this year might be arrogance. I said earlier this summer on a podcast that this is the peak of South Carolina football. Clowney and the other Gamecocks seem all too aware of that reality. And that’s not necessarily a good thing. Spurrier has always had a quick tongue; his jabs are expected. But Clowney’s mouth runs a 4.46. Posted on July 17, 2013, in Blog, Georgia Bulldogs, South Carolina Gamecocks and tagged Georgia, Heisman, Media Days, South Carolina. Bookmark the permalink. 6 Comments. There’s nothing wrong with a little trash talk! We’ll see who’s was worth it in 52 days!! Oh yeah… one more thing: Clowney for President!! I found Clowney’s decision to single out Murray and a few others was interesting. Honestly, if he had said, “Every quarterback I play is scared of me,” it probably wouldn’t have been as big of a deal. The nation would have agreed! Thanks for reading, I hope the Dawgs can put on a better showing against Carolina this year! How’d you find your way over to a Dawg blog lady 😉 ?!?! Dude – I agree, the only thing I found interesting was that he didn’t make it an all-inclusive statement. Wonder if that was a conscience decision or not. Also, the biggest thing that’s bothered me is the disregard of UGA as a contender in the East. Clowney wasn’t the only one who forgot to mention Georgia when discussing contenders, Coach Stoops also skipped right over us… hopefully that gets the boys blood going like it did mine!